Last week, I told you about a lovely old fairy book called Blossom. 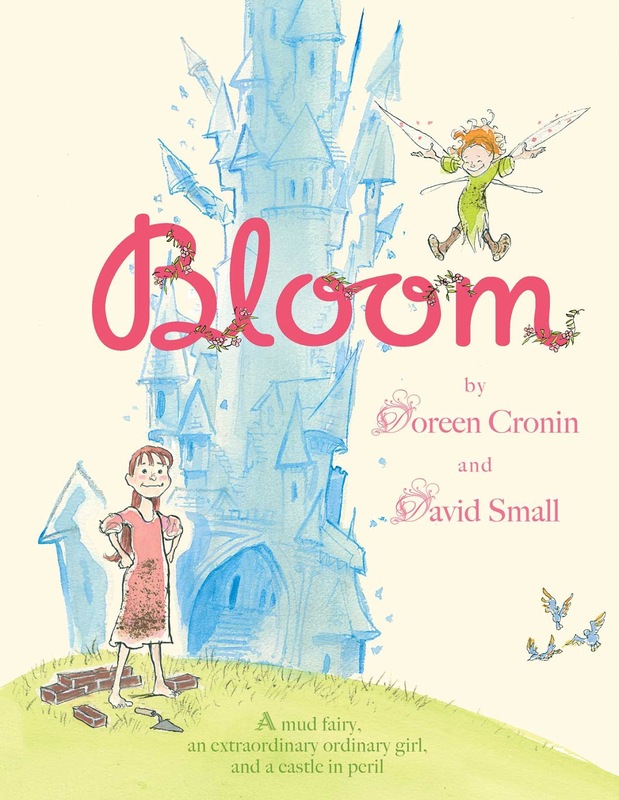 Today, I'm sharing a wonderful new fairy book called Bloom. If you're sensing a theme - well, aside from the whole fairy thing, the titles are completely coincidental. 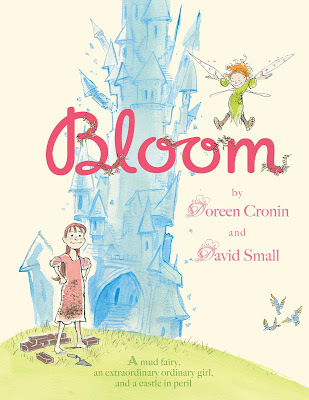 Bloom by Doreen Cronin, illustrated by David Small. The blurb at the bottom of the cover reads: "A mud fairy, an extraordinary ordinary girl, and a castle in peril." The story? Well, there was once a beautiful glass kingdom, and in that kingdom lived a little fairy named Bloom. Bloom was filthy. She was caked in mud, with beetles crawling in her wings. Her main job was to keep the kingdom in working order. But as the kingdom grows and becomes more prosperous, Bloom and her dirt are no longer welcome. She leaves. The trouble with glass, of course, is that it breaks. The kingdom becomes cracked and chipped and shattered, and tape just isn't working. The king and queen remember the powerful creature who once lived there. First the king goes to the forest. He finds Bloom, and asks to see the magic that will save the kingdom. She shows him a bucket of mud. "How dare you!" As the castle breaks more and more, the queen decides to visit Bloom. Bloom shows her the bucket of mud. "How dare you!" the queen huffs. Eventually, the only piece of the kingdom left uncracked is the queen's crystal sugar spoon. An ordinary little girl named Genevieve is charged with protecting it. It is the meek, plain little Genevieve that the queen dispatches to find Bloom one more time. Genevieve asks to see Bloom's magic. Once more, Bloom hauls out the bucket of mud. This time, Genevieve asks how the mud will save the kingdom. Bloom teaches her to make bricks! They build a lovely house in the forest together. Bloom convinces Genevieve that she herself can fix the kingdom. Genevieve knocks on the castle door. It shatters. "I am here!" she calls. "Then an ordinary girl rebuilt the kingdom." 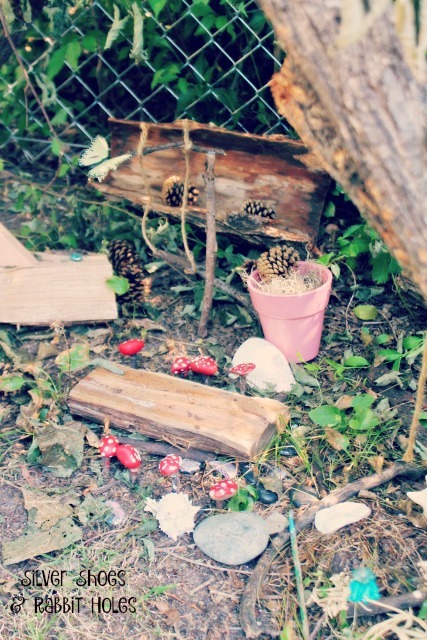 We are still working on our newest fairy house. 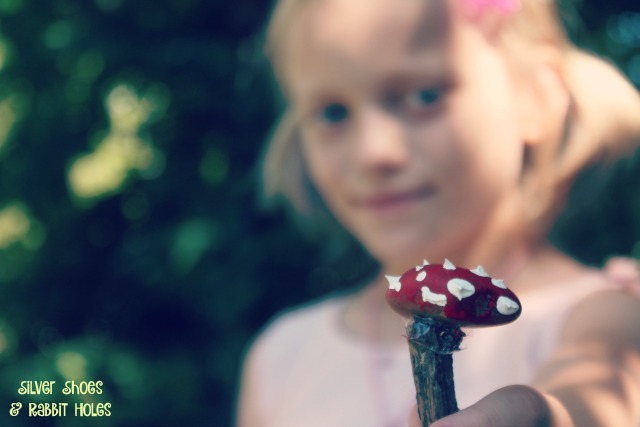 Today, we made toadstool stools. I hot-glued smooth rocks to some short twigs, and then the girls finished them off with red and white acrylic paint. 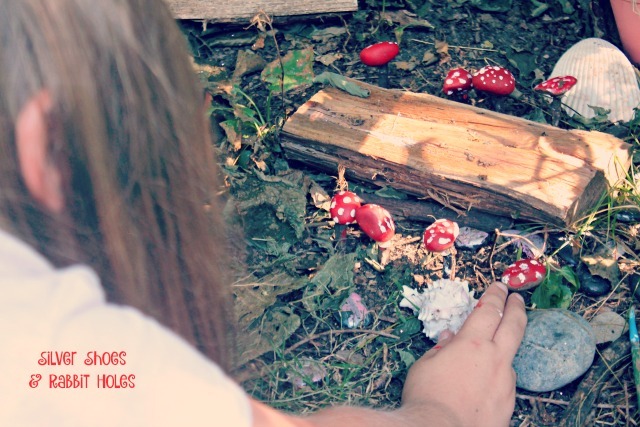 Here is our little table with eight fairy toadstool stools. Our next step will be to set the table. Perhaps a runner and placemats? Acorn or nutshell bowls? That book looks AWESOME. My kids would love it! And those toadstool stools...! They are adorable! Pretty sure we will have to try that this summer. It is such a great book. It was very different. Reading enough fairyish books, it was great to see one with a twist! Oh my gah your toad stools! everything looks so beautiful! 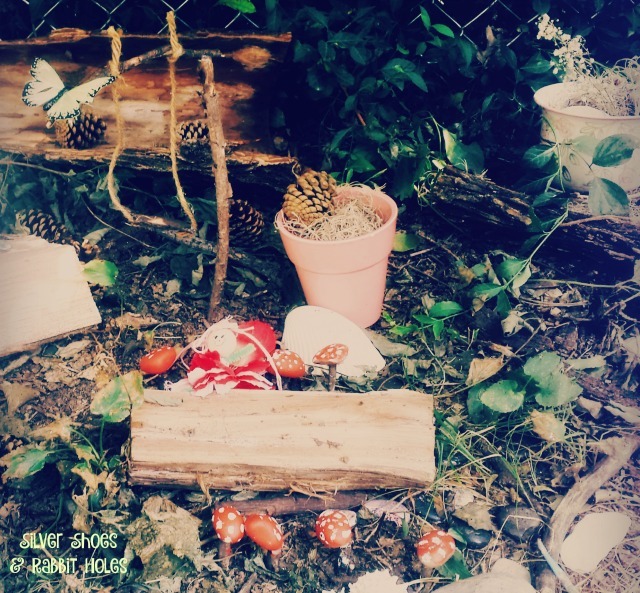 i am sorry to say i have not done squat with our fairy garden, but now you've inspired me. The girls are out back again now, but I swear, we have giant mutant mosquitoes this year. I doubt they last too long.